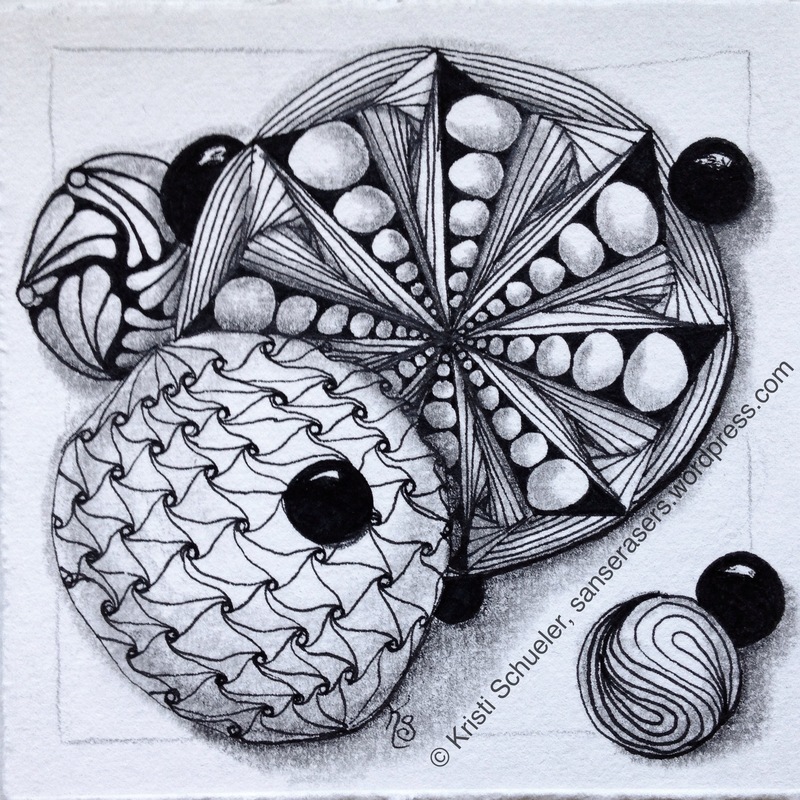 Spheres with Disc Inktober Zentangle #2 featuring cadent, gneiss with purk and paradox, kozy, cruffle and black pearls. It is day six and I only just finished my second tile.I’m full of excuses. It really boils down to not finding a groove yet. I have a hard time taking time to do my own things when DH is around and he has every other Friday off which happened to be this week. We also are lacking in the lighting department because lamps are bulky and expensive to move across the country. With the nor’easter this weekend and 11 straight days of cloudy skies things were just overall very dark in our apartment despite an abundance of windows. I’m also just slow. 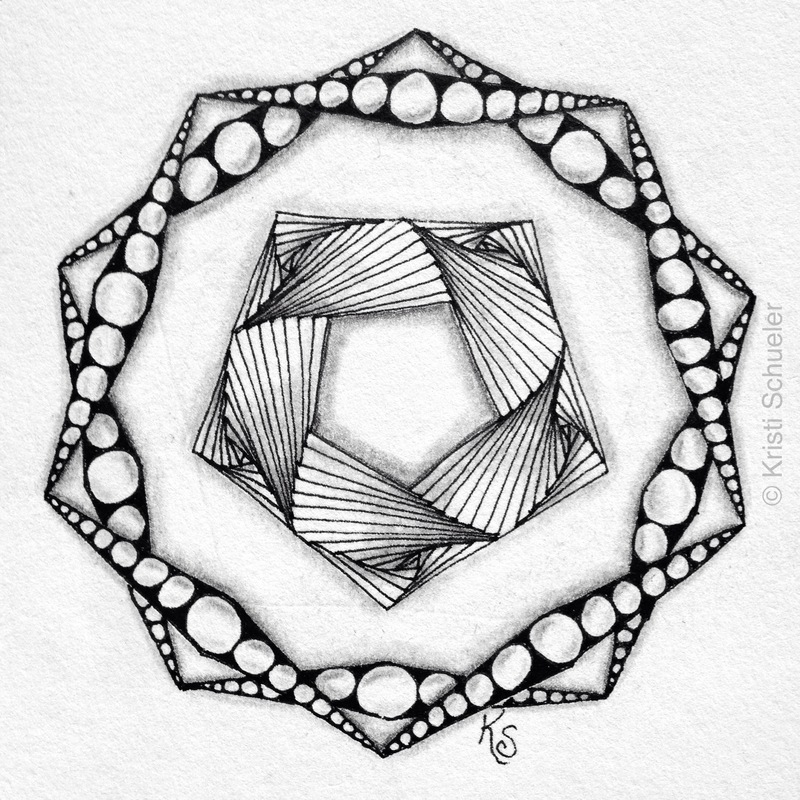 I laugh whenever I read that Zentangle is a 15 minute process. I don’t even get all the patterns inked in 15 minutes when I know all of them well. Then on Saturday I was felled with some sort of odd malady which I was still cautiously recovering from on Sunday. I still don’t know what the cause may have been. Too much gluten? Inktober Zentangle #2 sans shading. You can see a lot of wonkiness and it is pretty uninteresting. I almost passed on doing anything more with it, thinking it unsalvageable. The shading masks my wonky cadent and it’s definitely not round “sphere.” And overall it just brings more dynamics to the piece through the dimension and layering it creates. I think really the shading is some of what I love most about the tangling process, yet when I first started I neglected that step for a few weeks or more! So sad! As has become usual for me, I used three different leads in my shading – 3H, HB, and 3B to help develop more realistic shadows. 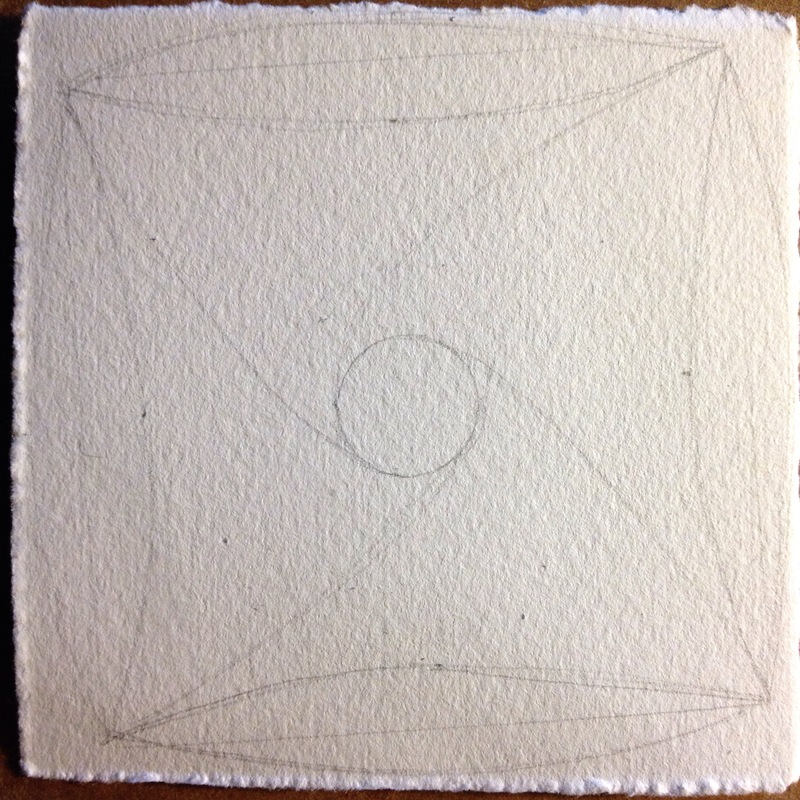 After yesterday’s rush jobs I’m hoping to carve out the time to at least ink a third tile today, but we’ll have to see. Then this evening is the monthly handcrafters group at my library so I *may* tangle there. I’ve brought my basic kit with me every time but always end up knitting because it seems easier to visit with others while knitting than tangling. I had to do this week’s Zendala Dare of course. Who could miss the 100th one?!? I ended up doing a lot of riffing on this one, just letting the pen do what it wanted. As a result there aren’t actually many tangle patterns in it. Though the oblong b’tweed outlined only with graphite kind of makes me think of pine cones. I’ll have to remember that when winter rolls back around! I can’t wait to go look at what everyone else has done with this great template! Zentangle Tile 2015-085, a toned tan tile featuring free form Weave in two colors, stickers, printemps, black pearls and mysst. I used Strathmore’s Toned Tan for this one. It isn’t quite as warm of a tan as the Zentangle tiles so I’m not as fond of the sepia on it (the colors of this photo are a little off since it was photographed under a lamp instead of natural light). I do like the finish though. It isn’t quite as absorbent so coloring is easier, but there is plenty of tooth to shade and highlight with graphite and white charcoal. I am still a bit meh about this one. I don’t feel like my Weave was free form enough and as a result it looks sloppily executed instead. Cate things I’m on crack. What say you? I also ended up putting in Mysst which I just haven’t been happy with using myself yet. I’ve seen examples of other people’s work using it and liked it, but I have yet to like my own stuff using it. I do however love Stickers! What fun! Zentangle 2015-088 zendala in progress on a coffee dyed unbleached coffee filter. Yesterday was dedicated to finishing my Sunday Smackdown #3. This is a sneak peek of it in progress. I completed all the drawing last evening, but I’m still on the fence whether to add any highlighting and shading. Cate says to post it everywhere and frame it and hang it in our living room once we’re moved. We’ll see. It would suit our furniture in a way… I’ll likely post another shot of what it looks like now on Instagram (fiberfool) at some point today if you’d like to ring in on whether I should take it further or leave it as is. 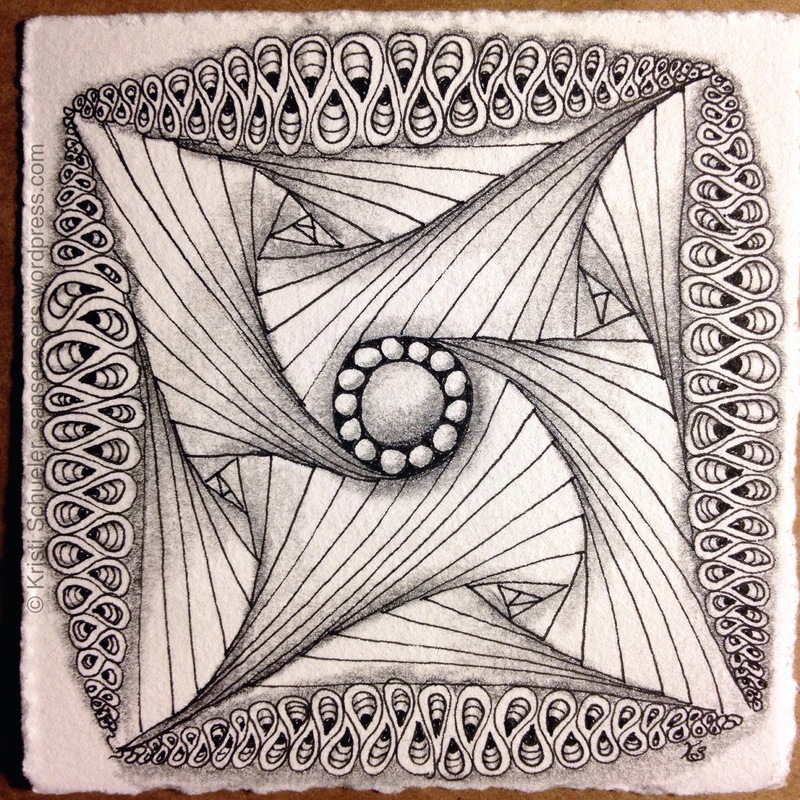 Zentangle 2015-087, my first ribbon with flying cadent on Toned Gray Strathmore paper finally done. I think. I think I’m done with the first toned gray zentangle inspired art piece. There is a good bit of open space in the lower left yet that has me slightly unsettled. I did end up adding Sunup Sundown on the ribbon and did fairly extensive shading. I need practice on ribbon work though. But Sunup Sundown could very easily become a mac & cheese pattern for me. Loved it! 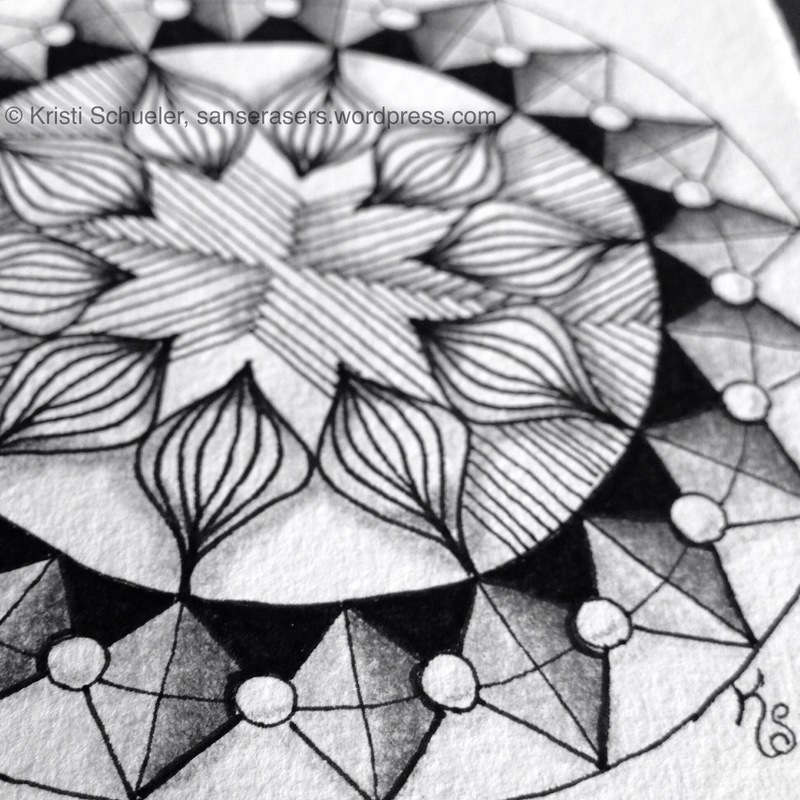 I’ll be back soon sharing my finished Coffee Filter Zendala and the how-to for my response to Sunday Smackdown #3. I’m feeling very behind. In everything. Including posting here. There has been tangling going on. Thank. Goodness. I am nearly caught up on my 365 tiles thanks to the zendala class Cate and I took with Sue Clark of Tangled Ink Art on Saturday. 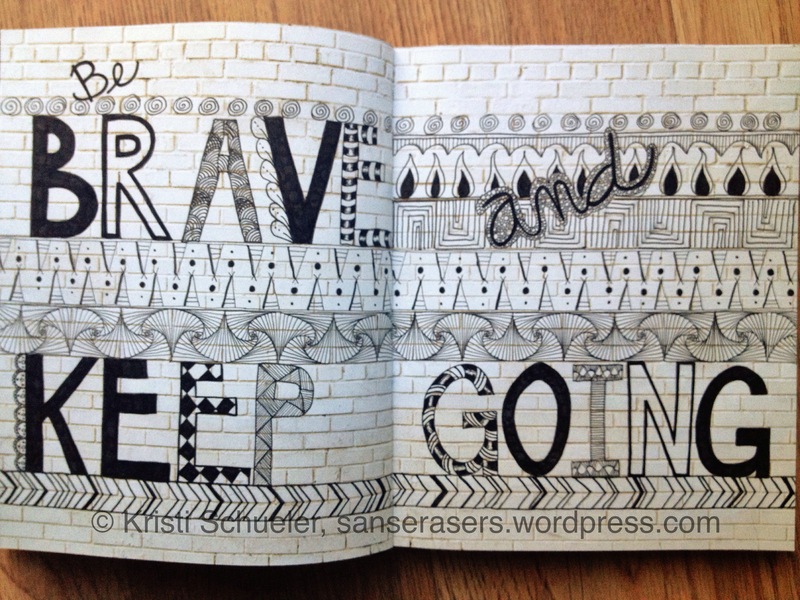 I manage to tangle everyday, though Sunday was just finishing up the tiles from class and some sketchbook tangling. 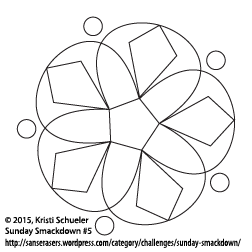 I even completed one tile for this week’s Sunday Smackdown! I have other things from the above activities to share , but seeing as it is St. Patrick’s Day today and the tile I did meets the Diva Challenge for this week I’m posting that today and will see about sharing the other stuff later in the week. If you want more timely updates with less banter I’ve been posting as I go on Instagram. 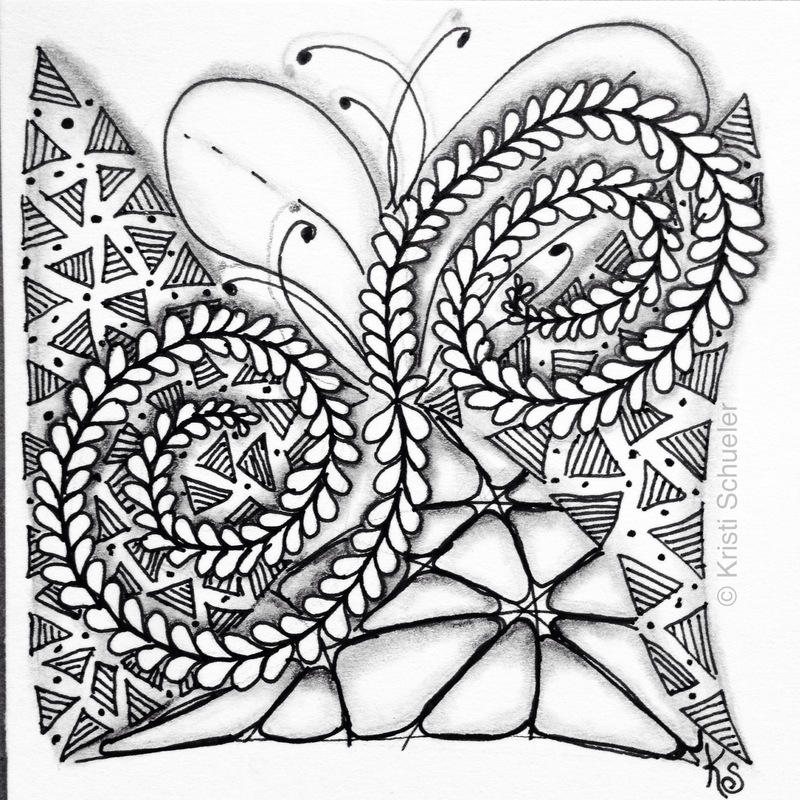 Zentangle Tile 2015-074, Diva Challenge #209 “St. Patty’s” featuring a paradox shamrock. I decided to try my paradox heart technique in an irregular shamrock string drawn without picking up the pencil. I was a little rushed. I’m not certain if it was the rushing or the irregularity of the hearts making up the shamrock (an experiment I’ll have to play with) but I don’t think it is as striking. I did the color with Neocolor II watercolor crayons. A peek at my storage of my Neocolor II watercolor crayons for portable coloring. I keep my watercolor crayons in 2 plastic travel soap boxes (1 for cool colors and 1 for warm colors) with a folded up paper towel to fill up the extra space so they aren’t getting beaten up in transit. The paper towel also gives me a place to clean the tip of the aquabrush I use between colors if needed. The inside of the lid is my palette, scribbling the colors I want on it and picking them up with the aquabrush. It works fantastically! 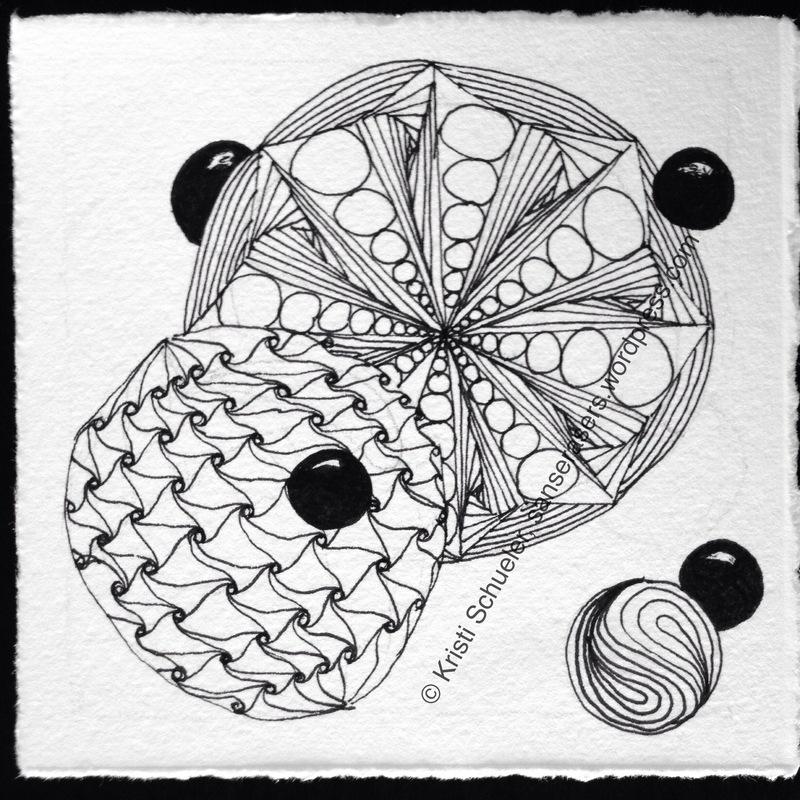 “One Zentangle A Day” day 22 tile featuring Kathy’s Dilemma and Flux tangleation with some regular Flux, Fescue and N’Zeppel. The patterns for today’s exercises were a little more to my liking. I had already worked on putting Flux on a curve so this was really good practice. My very first Zendala Dare (#96)! Here I used a variant on Yoga and Paradox. I had carried around the template for last week’s Zendala Dare, #96, at The Bright Owl since Erin posted it. It really resonated with me, but I never got the opportunity to work on it until last night. I think I’m in love with Zendalas! I’m not surprised. I’ve long been interested in mandalas, even created some digitally with my photographs in the long, long ago before I was even a very good photographer. 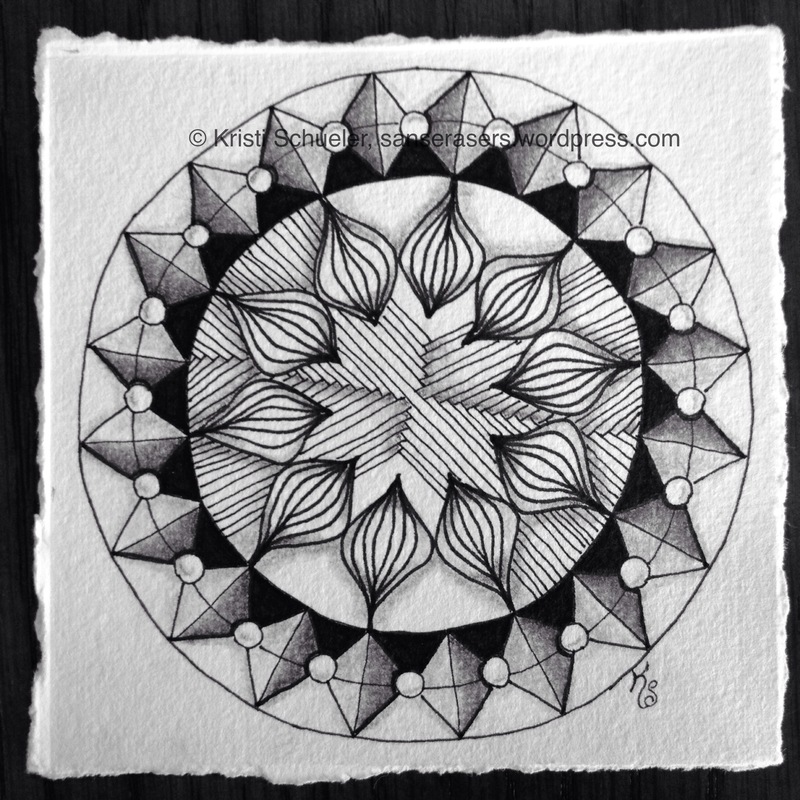 I’m also thinking that in addition to Zendalas appealing to my preference for order and symmetry in design they are kind of uber-Zentangle practice. You get multiple layers of repetition – the strokes making up the patterns but also the repetition of the patterns around the mandala form. I scribbled pencil on the back of my print out of the template and then traced the template to transfer pencil markings to the tile. In the process I learned it really doesn’t take that much pressure to transfer 3B lead. If you look closely at the tile you can see a set of lines I chose to ignore — they are indented! I pressed a bit too hard, LOL!